Cat anxieties are surprisingly common problems and include issues like fear of thunder, fireworks, vet anxiety, separation anxiety, travel, crating, reactivity, vocalizing and much more. Wraps around cat at pressure points. Thousands of veterinarians and trainers are now recommending Thundershirts for their anxiety cases with dogs, and now for cats. Thundershirts help relieve the fear of thunder, fireworks, vet anxiety, separation anxiety, travel, crating, reactivity, vocalizing and much more. 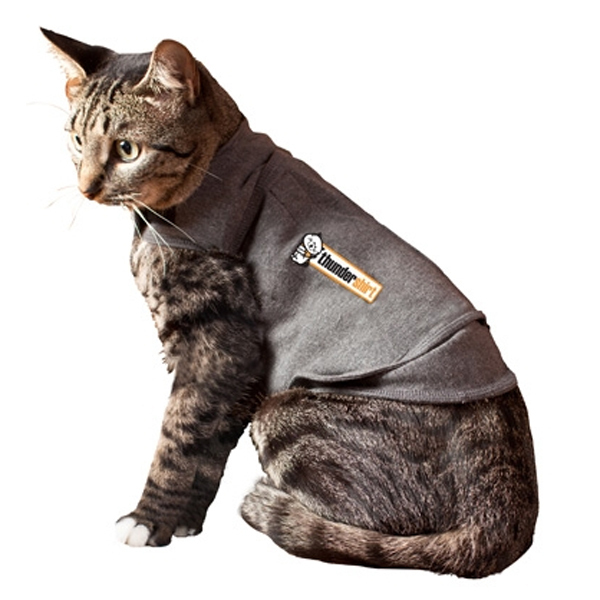 Small Thundershirt for Cats < 9 lbs. Medium Thundershirt for Cats 9 - 13 lbs. Large Thundershirt for Cats > 13 lbs. I was very satisfied with my shopping experience with Baxterboo.com. The website is user friendly and they have a wonderful selection of items to choose from. Shipping was fast (and free) which I love. Will totally use BaxterBoo.com again!! !